The bittersweet 'funny animal' comics of French master comic artist Dillies collected in one specially priced set. From Abelard, a love struck little chick who'll go to the end of the world to catch the moon for his beloved, to Bubbles & Gondola with Charlie the mouse whose writer's block can only get unstuck when he gets out to the world, to Betty Blues, about a hard bitten jazz trumpeter duck and his gorgeous floozy he loses to his music, these are fairy tales for adults with the surrealist charm of Herriman's Krazy Kat. 3 volumes collected in one specially priced set. "Highly recommended. A timeless, all-ages appeal to these literary graphic novels." Little Rice Duck has built himself quite the reputation around the West Wood, playing his trumpet in bars with their smoky, sweaty ambience, tequila sunrises, and jazz. But between his trumpet and his flame Betty, things are going astray. Betty is drowning her need of him in expensive champagne, something someone else is more than happy to provide... something he'd much prefer, like her, would just stay chilled. "Recommended for those who think talking animals don't always have to just be funny animals." "Like a jazz song, Betty Blues is a short but wild ride that comes together in the end and lingers well after the music is over." "dusky mixture of anthropomorphic animal comics and noir lighting." 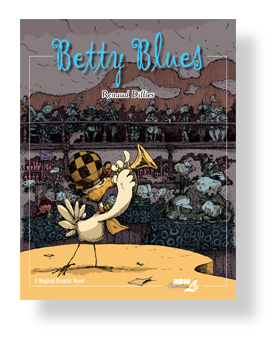 "Betty Blues is a powerhouse piece of work, a rich, textured, emotionally wrenching journey that challenges the reader at every turn…I was captivated by Betty Blues from beginning to end." "While a melancholy tale perfect for overcast days with a little Bessie Smith or John Coltrane in the background, the artwork will be sure to lift your spirits. Hopefully, more publishers will see the value of expanding their styles and allow a bit more freedom for their artists. Until then, we have publishers like NBM hunting down these treasures on our behalf." "The art is as lovely as it is irresistible." 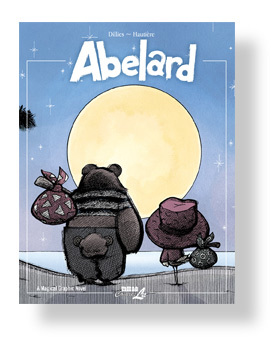 "Abelard is still one of the best things I’ve read in ages. 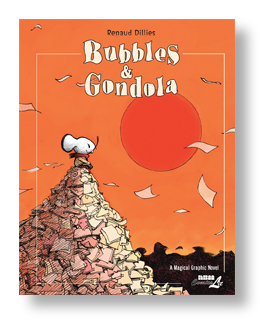 And Dillies’ first book, Betty Blues, winning Best Debut at the Angoulême Comics Festival, and now available for the first time in English, is up there." "Wonderful, thoughtful, and moving. Grade: 9/10"
"Dillies’ artwork is quite beautiful, his charming characters almost deliberately at odds with some of the themes and actions of the tale, yet never feeling wrong. His stylised colours perfectly suited to detailing all the wonders, all the misery, all the dreams Abelard finds along his journey." "Its bittersweet tale of how one life can deeply touch another is meant for burgeoning existentialists and those who wish to see what comics are capable of through the prism of an idiosyncratic philosophy." "A Best Graphic Novel of 2012. Achingly beautiful and poetic… a mesmerizing book and a truly powerful one at that." "This stealth graphic novel starts out feeling like a sweet, whimsical pastoral children's graphic novel and slowly morphs into a wonderfully moving adult story that kind of sneaks up on you with its craft, intelligence and interesting themes. I'm going to remember this little bird for a while." "A poignant tale echoing the plight of early European immigrants, who abandoned everything they knew in search of a better life and nurtured hope even in the worst of situations. 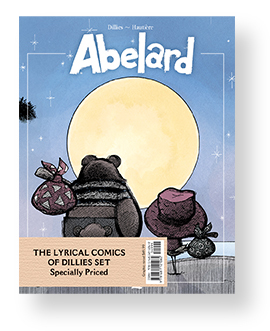 Abelard never loses his sense of optimism, and the world remains an awe-inspiring and whimsical place -awash in Dillies’s lush colors and nuanced sensitivity to mood." On a background of Django Reinhardt, this jewel of poetic fantasy is a fairy tale for all ages with spot on observations about life. Charlie is a mouse who’s trying to write but has a block. Writing is a solitary endeavor. A bird named Solitude comes to visit him to keep him company. We’re never sure he actually exists but in Charlie’s mind, yet he brings him out into the world, dares him to experience the unknown, unblocking his little existence… A drama about the blank page for Charlie who so wants to make the world more beautiful with his writing, we are transported into a tender and moving tale with a twinge of lyrical melancholy yet sweet, warm and ultimately elevating. "Why I finished it: I loved the dreamy sequence where Mister Solitude visits Charlie, who is reluctantly riding a gondola wheel. He says, "Gondolas deprived of liberty. Sad airships of an impossible adventure," and urges Charlie to enjoy the view. (When Charlie does, he realizes his gondola is flying above the clouds.)" "7.2/10. Full of small surprises, pleasurably mopey." "A delightful and well-executed story recommended to those needing a spiritual lift or creative inspiration... fresh, quirky perspective." "Disguised as a cute animal story, Dillies's substantive tale of writer's block, social anxiety, and the magical and restorative powers of allowing oneself to take a break and have fun proves striking in its visuals and narrative." "Dillies' art evokes the work of an earlier poetic penman, George (Krazy Kat) Herriman, though with a trace more detailed elegance. (The book's carnival scenes are particularly splendiferous.)" "An artistic style recalling Herriman's Krazy Kat and a fanciful imagination evoking St. Exupery’s simple, elegant flights of whimsy." "A certain magic is demonstrated when an artist, unfettered by perceptions of comics being for kids, uses the full paint box of tools available to him. The wild imagery, wandering through parties and dreamland alike, transports the reader in an emotional way that propels the practical mind into the escape of art." A Publishers Weekly "Graphic Novel as Gift 2011"